Williston Boy Scout Parker Soares works with volunteers to construct and install a walkway at Mud Pond Conservation Area. 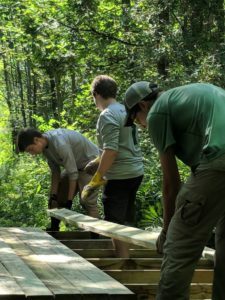 Parker Soares, a member of Williston’s Boy Scout Troop 692, recently completed construction and installation of a 30-foot walkway and a 12-by-12 platform to improve trail access at the Mud Pond Conservation Area as part of his Eagle Scout project. Soares said he was searching for a project that would demonstrate leadership, responsibility, planning and communication skills when he approached staff at the Town of Williston. The walkway and platform will maintain trail access during mud season in the spring and following rainfall. Soares and a group of volunteers logged about 80 hours of work on the project.